I believe the only way to return to innocence is to evolve, move ahead in the right spirit. On my second evening at the resort, before the cultural show (rather acrobatic tribal gentlemen performing a martial arts routine) we were shown a four minute video that spoke not about the resort but about the General Manager, a lady who had risen through the ranks. After a moment’s reservation on the relevance of the video, when I watched with an open mind, I saw the personal evolution of a hardworking woman and in some way the return to innocence of the resort. You look after that, which looks after you. Evolve Back, Coorg (earlier known as Orange County) works at various levels. Level 1: They offer you quality and a dose of luxury. 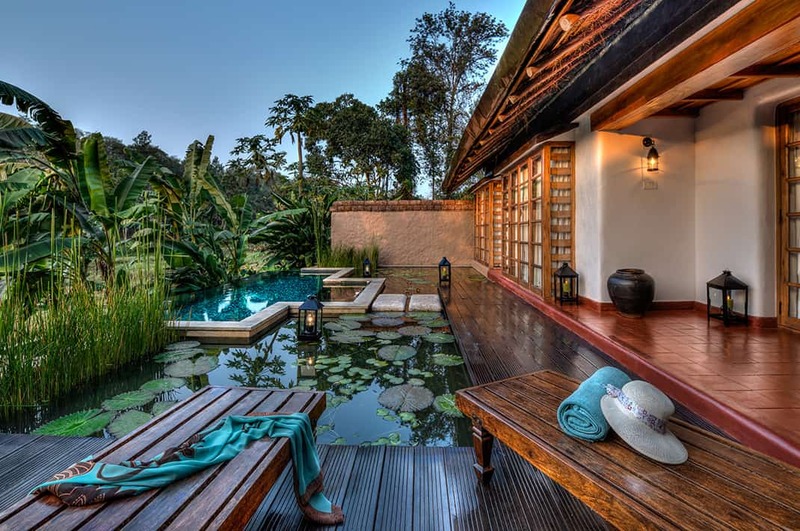 The villas and cottages (63 in total) come in five categories (Country, Lili-pool Cottage & Villas, Heritage Pool Villas and Lili Pool Bungalow) and are aesthetically pleasing and do not overwhelm you with luxury, despite the fact that they offer all that is required (needs, wants and even some desires like a plunge pool/Jacuzzi). Level 2: The food spread is sumptuous and leaves you asking for more, even on a full belly. Their multi-cuisine restaurant, Granary, offers a three-meal satisfying buffet spread. Next to that is the bar, Hunter’s Lodge, if you need your evening tipple. There are two other F&B outlets— Peppercorn (which offers a planter’s menu and regional cuisine) and Plantain Leaf (pure veg restaurant). river and the workers’ trail. Level 4: Explore the gorgeous region. The countryside is deep and green and the coffee is fawbulous. Drink to your heart’s fill and carry for friends and family. Make a stopover, if you wish, at the Madikeri fort (minor attraction and not well-kept) and at Bylakuppe, a large Tibetan settlement about an hour’s drive from the resort.